Image courtesy of Dave Meslin. Last summer, when city council unceremoniously voted to remove the Jarvis Street bike lanes (after very ceremoniously voting to install them the summer before, while David Miller was still in office) it seemed as though supporters of the lanes were all out of options. Mayor Rob Ford still had a solid council majority, and even though bike-friendly councillors managed to wrangle a temporary reprieve—the removal wouldn’t happen until separated bike lanes could be installed on neighbouring Sherbourne Street—it was pretty clear that Jarvis was eventually going to be restored to the state it was in before 2010, when, instead of the bike lanes, it had a reversible fifth lane for car traffic. Implicit in the decision to remove the bike lanes was a notion that most drivers wanted that fifth lane, and that they were pissed that it was gone. But activist Dave Meslin doesn’t think that was ever necessarily the case, and now, with the support of the Toronto Cyclists Union, he’s launching a publicity campaign to prove his point. Drivers for Jarvis, as the campaign will be known, will be launching officially tomorrow on the Cyclists Union’s website, but Meslin debuted it on his personal blog earlier today. 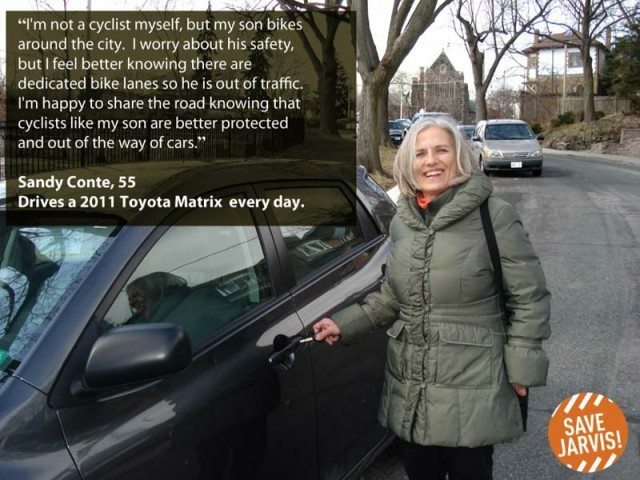 It features pictures like the one at the top of this post, of drivers who, for various reasons, actually like the presence of bike lanes on Jarvis and would be disappointed to see them go. Meslin is encouraging any drivers who might want to lend their image and their story to the project to get in touch with him personally. With council’s support for the mayor’s car-friendly agenda looking ever shakier, there may never have been a better time for an initiative like this one, but Meslin knows success is far from certain. The Cyclists Union has been organizing to save the Jarvis bike lanes for quite some time, without a breakthrough. This is only the latest effort.